Boat Orchid’s beautiful and exotic flowers are usually large in size and display a patterned lip. The blooms can last anywhere from 8-10 weeks and they come in almost all colours except blue. 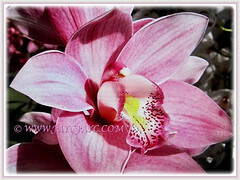 Its longevity of flowering has become the desire of many orchid enthusiasts and hybridisers. 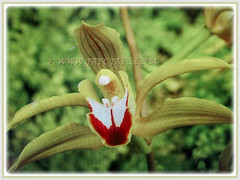 Botanical Name: Cymbidium hybrid (the genus name and to be followed by the hybrid name as accorded). Common Names: Boat Orchid, Cymbidium Orchid. Etymology: The genus name, Cymbidium is from the Latin word cymba meaning boat. Origin: A hybrid. It’s cultivated elsewhere around the globe. Plant type: A semi-terrestrial or epiphytic orchid plant. Features: Cymbidium Orchid is from the genus, Cymbidium that comprises of 50-52 species and from these, thousands of hybrids have been bred. A fast-growing orchid plant with arching stems that can reach a height of 1 m.
It has a clumping habit and produces strap-like green leaves. Its spikes bloom only one time, hence once the blooms have dropped you will not be able to encourage a rebloom from the spike as you can with other types of orchids. It produces tall and erect inflorescences held well above the foliage. Each flowering spike bears up to 30 coloured flowers and typically have a patterned lip. Flowers of Boat Orchid with many cultivars and hybrids come in almost all colours, such as white, cream, yellow, green and mauve except blue. Flowers can be up to 15 cm across though there are also miniature hybrid flowers around 5 cm wide. 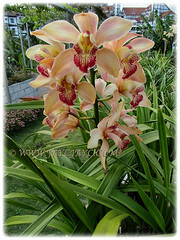 Culture (Care): Cymbidium or Boat Orchid grows easily with the least maintenance. Light: Best in dappled sunlight to thrive well. Full sun may scorch the leaves. It can tolerate partial shade. Moisture: Medium to low water needs. Do not overwater to avoid rotting the roots. It benefits in a high humid environment. Soil: Orchid compost which is coarse and well-drained soils. Others: This beauty does not like to be disturbed too often and should only be repotted when necessary. Divide and repot every 3-4 years by cutting old or diseased roots away with a sterilised knife. 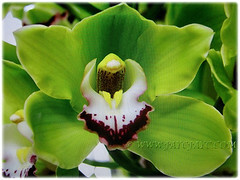 If your Cymbidium orchid is receiving the optimal amount of light, the leaves will be a yellow-green colour. Too much light will cause the leaves to become yellow and too little light will cause the leaves to become a very dark green colour. Feed once every two months with a balanced orchid fertiliser. A weakly ¼ strength works well. Once a month use clear water to flush any accumulated salts from the potting mix. Generally free from serious garden pests and diseases. However, watch out for orchid beetles, thrips, aphids, scale, slugs, snails and two spotted mites. 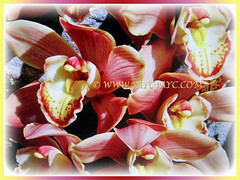 Cymbidium Orchid or Boat Orchid typically bloom in the early spring although sometimes you can see flowers beginning to bloom in October or bloom all the way until June. Cymbidiums are cool climate beauties and are popular due to their ability to thrive in cooler and drier conditions. If you live in an area with mild temperatures and no frost, you may be able to successfully grow Cymbidium orchids outside. During the summer and fall, day temps should be between 23.9-29.4°C and night temps should be between 10-15.6°C. In order to initiate the growth of flower spikes it is necessary to have a nighttime temperature difference of about 20 degrees in the fall. Cooler night temperatures are also needed while the plant is in bud. During the winter, day temperatures should be between 18.3-23.9° and night temperatures should be between 7.2-12.8°C. It can be grown outdoors in frost-free regions. Grow outdoors in warmer climates or move indoors when frosts threaten, which is when they are most likely to bloom. It requires an average home temperature range of 18-24°C during the day and 13-18°C during the evening to thrive well. 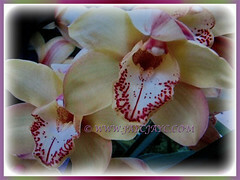 Cymbidium orchids require humidity levels of 40-60% in the winter when the orchid may be in bud. If you need to increase the humidity level in your orchids growing environment, you can do so by using a specially made humidity tray or simply placing a humidifier close by the orchid. Remember, if you have high humidity levels it is equally important to maintain proper air movement to prevent orchid disease. 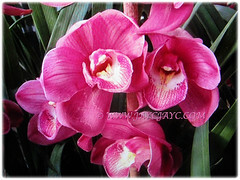 When Cymbidium is in active growth, you will want to fertilize regularly. 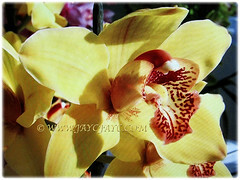 An orchid fertilizer solution of 20-20-20 is recommended. During the winter months, applying fertilizer once a month is sufficient. Never add fertilizer to an orchid that is dry because you can cause severe damage to its roots and leaves. Propagation: Easily propagated by division of its pseudobulbs. It can be divided once the orchid has bloomed and new growth is starting to show. Each division needs at least three to five pseudobulbs. Alternatively, use the backbulbs which are the older pseudobulbs that have little to no leaves. Simply remove these with a sterile cutting tool and strip off any leaves that may still be on the backbulb and pot in a small container. 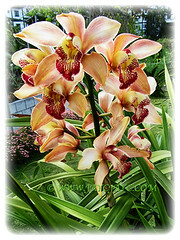 Usage: The blooms of Cymbidium or Boat Orchid are often used in cut flower displays as well as in corsages. 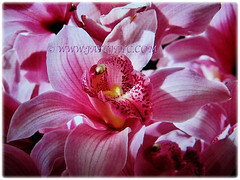 It’s an ornamental plant with long lasting blooms and has become the desire of many orchid enthusiasts and hybridisers. Suitable for growing in containers/tubs or in the ground. Ideal as an indoor orchid plant or houseplant. They will grow in pots on shady patios or under trees.